Free thinkers escaping the plantation of dependency. 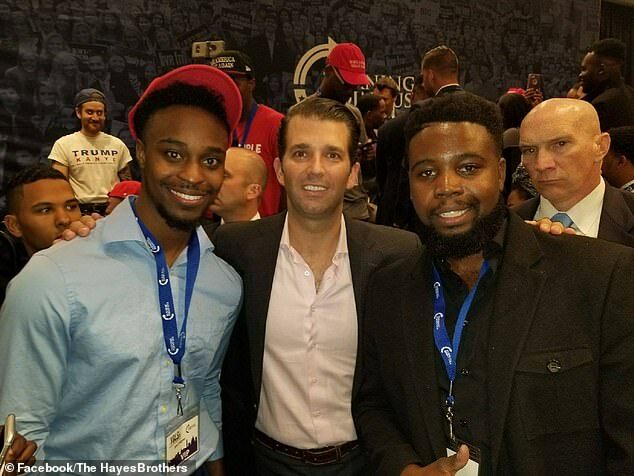 Donald Trump Jr. told young black conservatives attending a summit in Washington that they have ‘guts’ for supporting his father. ‘You guys have the most guts of anyone in America,’ the president’s eldest son said at the Thursday evening event hosted by Turning Point USA, according to Politico. The conservative group that caters to youth is hosting a three-day summit in D.C. that includes an event at the White House this morning. President Trump will address 250 or so African-American youth at the East Room event. His son kicked off the conference that continues all-day on Saturday at a Thursday night event at Capitol Hill’s Hyatt. The president’s son expounded on the reduction in black unemployment in under Donald Trump’s leadership, driving home the record-low in joblessness in the demographic that’s often touted by the president. Donald Trump’s oversight of an improving economy is one reason he said Democrats are ‘losing their stranglehold’ on the African-American vote. ‘They’re resisting the fact that they are losing their stranglehold on entire communities,’ the president’s son told the crowd, according to Politico. Donald Trump Jr. posted video of himself mingling with attendees to Twitter. ‘Check out this AMAZING response from young black leaders! The largest ever gathering of young black conservative leaders!! Hey media, will you cover this? Why not? This is history!’ he said.